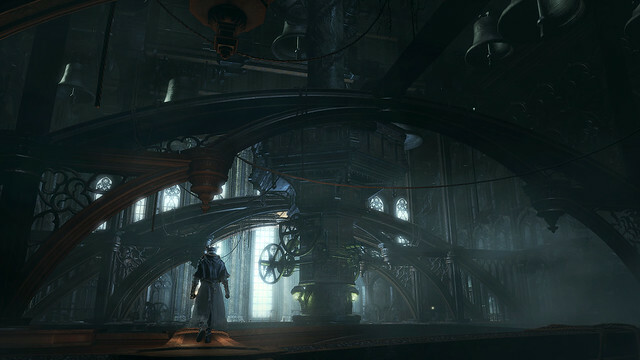 Hello, Bloodborne fans! The Old Hunters expansion will soon be bringing a brand new nightmare world of dangers and horrors for you to conquer, not to mention a host of new weapons and armor for your arsenal. If you haven’t yet, pre-order on PlayStation Store by Monday to get a special bonus PS4 theme. That way you can have it equipped when The Old Hunters launches on Tuesday for $19.99. Keep reading for more information about the expansion and how to access it within the game, as well as details about the new content and updated online features in the 1.07 title update hitting today (title update available to all Bloodborne players). As outlined in previous blog posts, as well as the website, The Old Hunters introduces many new horrific environments and enemies, as well as devastating new weapons and abilities. Brador, seen donning the scalp and horns of a foul beast, is an ancient Hunter and assassin once employed by the Healing Church who sits in a dark cell, waiting for something—or someone—with bell in hand. And while exploring the new nightmare, beware of the Bell Holder. This massive enemy wields the Bell Axe and is one of the most formidable beasts you will face. I’m also excited to share information about two new weapons available in The Old Hunters expansion. The first is the Bloodletter, a sick and demented weapon wielded by Brador. This weapon assumes its true form after drawing upon the blood of its wielder. In other words, you must plunge it into your own chest in order to unleash its true power. 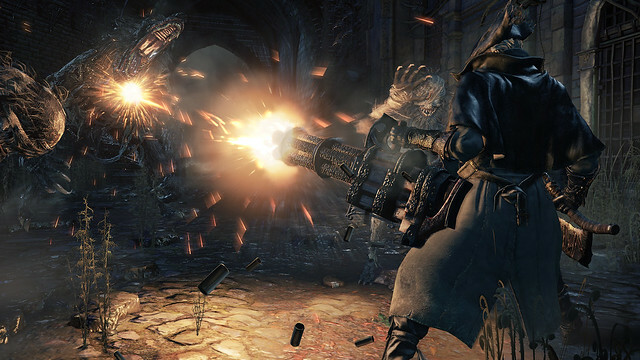 You will also find the Gatling Gun, a portable version of the stationary rapid-fire gun that Djura uses to rain down lead from the tower in Old Yharnam. While it is great for rapid-fire attacks, it is also cumbersome and goes through Quicksilver Bullets very quickly. Players will also discover a new rune called The Beast’s Embrace. After many failed experiments, this rune was forbidden from use. That did not stop its discovery from becoming the foundation of the Healing Church, however. Those brave, or foolish, enough to unleash the power of this rune take on a ghastly form and enjoy boosted transformation effects, especially when wielding a beast weapon. Once you have purchased and downloaded The Old Hunters expansion, you’ll need to follow the below steps to access the new content. Go to the Hunter’s Dream and receive the Eye of a Blood-drunk Hunter from a messenger. 1. Go to the right-hand end of the square to trigger an event. This event will take you to the new area: the Hunter’s Nightmare. 2. Lighting the lamp in the new area will allow you to travel to and from the area via an Awakening Headstone in the Hunter’s Dream. Prior to the launch of the DLC, all Bloodborne owners will receive title update 1.07, which adds new features and drastically changes the online component of the game. The patch goes live today, so remember to update your game and try out the new features. As mentioned in our last blog post, update 1.07 also adds the “League” feature and introduces new NPCs into the game’s world. Join the League by meeting with Summon Master Valtr and obtaining the “Impurity” rune. You’ll need to summon him inside the shack to the right of the first lamp in the Forbidden Forest. Once you have memorized the “Impurity” rune, you will be able to access League ranking screens. Upon successfully completing a coop session, you’ll receive the “Vermin” which you must crush to increase your points and therefore your position on the League leaderboard. Can’t wait guys! Does it have new trophies as well? Also I thought we were supposed to get a theme if we earned the Platinum trophy from the game? I never got one and I earned the Plat way back in march or april. That offer is for Europe only. I also like to confirm that Platinum Theme is coming soon. Thanks for the update, Dais! I’m incredibly excited to play the new content and receive a theme for achieving platinum. Keep up the great work, FromSoftware! Given this is a US Playstation Blog post and the reply states the Platinum Trophy theme is coming, does that mean it is now in the works to come to North America? So what’s the estimated game time for dlc? And I read before if u got platnuim u get special theam? Is that different from the one u get if u pre order it? The Platinum theme is different from the dlc preorder theme, according to what I’ve seen between the two on Google. The Platinum Theme is different from the theme that we’re giving away for Pre-Order. Can we get confirmations at to which regions will be getting the Platinum Theme? Blast. Why didnt I take the day off of work?! I also have yet to receive the Platinum trophy theme. It’s for European players only. MakoSOLIDER: just contact SONY for Platinum trophy theme. Did that work for you? I never received the platinum theme either. What’s the best way to contact them? Thanks in advance! I pre order the dlc already but never received the pre order them at all I purchased it through the website. Also since the dlc automatically downloads on Sunday which is November 22 we still have to wait till Sunday correct? Just go to themes on ur settings menu and u can download it from there. From your PS4, please go to Settings, Themes and Select Theme. 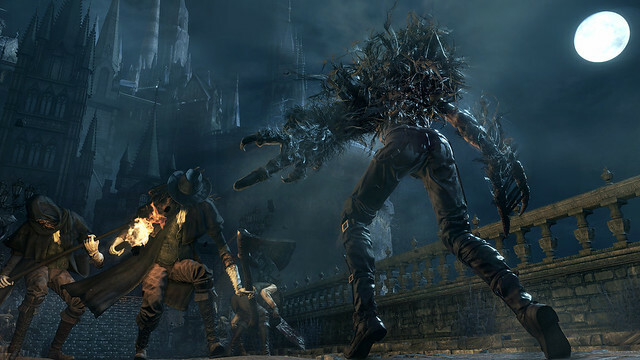 “Bloodborne City of Yharnam Theme” should be available for download. Thanks! Ok thank you. Do we still not know what the dlc trophies are? What about the size of the dlc if I want to digitally download it ? Most of the dlc is in the new patch, 9.6gbs. The download from the dlc on the store is 13mb, so it’s just a key to unlock the dlc contained in the new patch. If the patch contains the dlc, then why should we wait an extra week to unlock it ? The Best DLC since Left Behind. My save file is on the New Game + difficulty, so am I stuck playing the Old Hunters on this difficulty? Really wouldn’t want to start a new character file. If you have started playing in New Game+, the difficulty level for The Old Hunters will be set to New Game+ also. Most likely, the dlc in Dark Souls 2 scaled with whatever NG you were on with your current character. One must fight a new boss just to access the DLC? Awesome. Any thoughts if this will be the one and only add-on to this already awesome game? May the Good Blood Guide Your Way! Can I finish the game before playing the DLC? I love the game I’m just confused as to play order. I don’t want to miss out on story or NPC meet ups if I defeat certain bosses that lock out my options. For example I’ve been avoiding Rom. 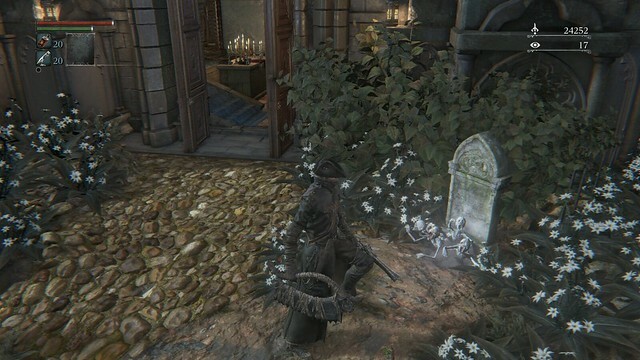 I was suppose to meet up with a Eileen the crow to go hunting but her story may have advanced. I know I’m suppose to look for a back door to Losefka’s Clinic in the forbidden woods. It would be cool to know your quest limit before and after facing a boss. I was wondering if it is possible to access the DLC even after killed rom the spider? Or I need to start a new game? You will be able to access the expansion after defeating Rom, the Vacuous Spider. Back on Nov 5th you guys mentioned that codes for a special theme were to be sent out to those who had the platinum trophy. When will those be sent out? Can’t wait for the expansion! We are born of the blood, made men by the blood, undone by the blood. Hype confirmed. Would it be better to play this with my character in New Game + or start a new character to go through it? 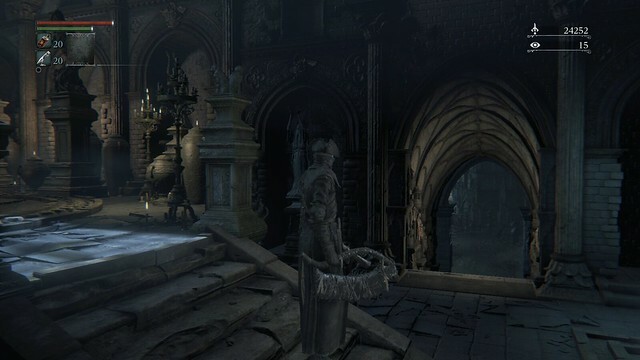 I have a question, if you’ve already beated Vicar Amelia on a playthrough will you still be able to do this and get to the new area? Yes, please start from Step 2 if you have defeated Vicar Amelia. Please give us the option to turn off chromatic abberation effect it makes me sick can’t buy the game because of it. No Flash sale this month? Any news about the theme for obtaining the platinum on Bloodborne? I’m from Mexico. Please help me out. I can´t find the Eye of a Blood-drunk Hunter-item in the hunters dream. With the character I am using, i have already defeated Micolash and of course Vicar Amelia. But the item didn´t spawn. What do I do now? The DLC isn’t out yet, it should appear when you install it on the 24th. is it true that the platinum theme is coming to players in North America? just read an article on n4g stating this but nothing here says anything of the sort. I need to create a new character to access de dlc? I just want to be sure: I finished the game already and started a New Game+. Now, do I actually have to advance in this new game and defeat the bosses again to access the Expansion or by having completed the game do I have access automatically in the New Game+. If I do not, this will be a GREAT RIP-OFF because I only bought the expansion to play that NOT play the game all over again (be it great as the experience was). If this is however the case, how can I get a refund because its a little shallow having been informed NOW that the DLC requires additional work and not readily available. THAT should have been mentioned AT PURCHASE TIME. If I am wrong, please accept my apology for yelling – otherwise IT’S DESERVED. This has always been a trend for the Souls games, and they even mentioned that it would “become available at some point in the story.” I doubt that Sony is going to offer you a refund for not researching into their product before you buy it. Personally, I’m fine with it. 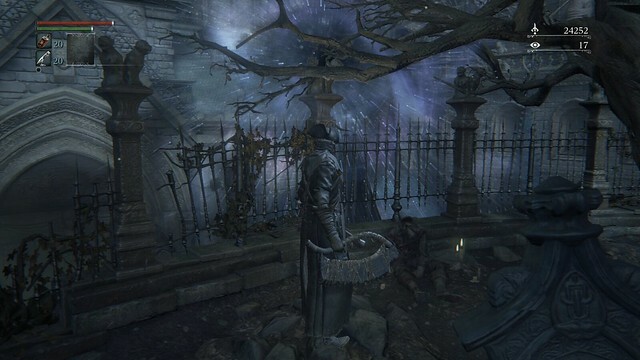 Vicar Amelia only really requires you to fight Father Gascoigne, so it’s much easier than I had been expecting the line of bosses in NG+ awaiting me to be. is dlc platinum trophy in one playtrough possible? there’s a way to do it which involves saving before you fight the last boss and transfering the save on a usb stick and doing that 3 times to get all the endings. Without the USB save trick you will need to finish the game at least 3 times so NG++. It’s well worth it though. i agree, it’s worth it. 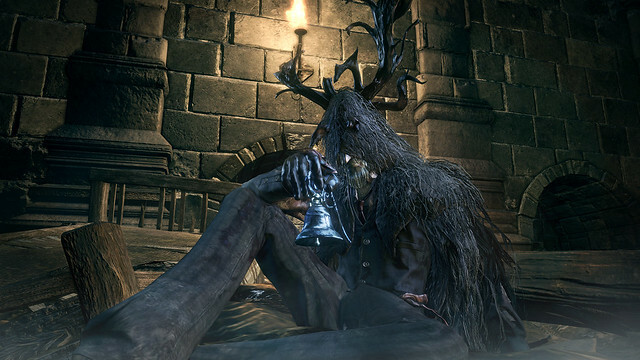 plus the platinum needs you to defeat yarnham in the chalice dungeon which is the most interesting fight in the game. Can I have a link for the japanese version of this article? I’m on ending game, so… I will need to create a new character to access the dlc? If you’ve defeated the final boss already, then you will need to proceed to the Grand Cathedral again and defeat Vicar Amelia. If you haven’t yet entered NG+, then you should be able to access it immediately with your desired character. Does anyone know how we are going to get the free theme that they are giving us platinum trophy owners? Im soooo excited for all this new content, this is def the best game of the year!! There is the CUSA00207 code game. I’m thinking about taking the game GOTY version. Amelia is technically the second mandatory boss after Gascoigne that you have to beat to progress the story. Every other one (Cleric Beast, Blood-Starved Beast, Darkbeast Paarl, Hemwick Witches, Logarius) is entirely optional. You can reach the Grand Cathedral in less than two hours, so this is really no big deal. What I’m worried about is that the “improved matchmaking” doesn’t seem improved at all. The same old restrictive level cap (10%+10) is in place, even if you join this “co-op” covenant. Why do you implement a matchmaking override system that you can potentially abuse with the global password “password”, but you can’t design an ingame covenant that would simply allow everyone to play together whatever their respective levels? As a BL4 Waste of Skin I’m not afraid of helping a BL250 confederate in need. Why can’t From let me choose to do it? Dark Souls 2 is more permissive in that regard. 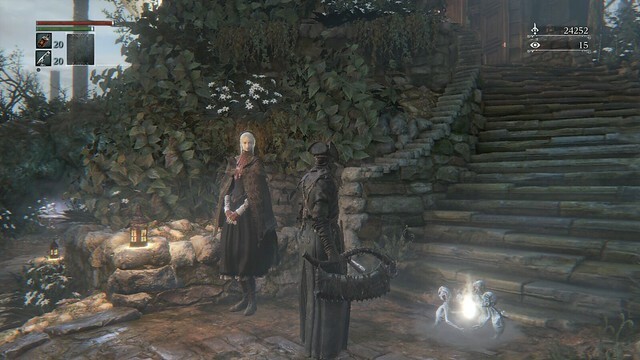 So I’m on ng+, in front of father gasgoigne. Do I have to defeat him and Vicar Amelia in order to access the expansion? Still a bit confused here. This is a US PS FORUM. Will the Platinum theme be made available to US players who have accomplished this? I earned the platinum trophy & contacted Sony. The rep stated the theme is only available for EU players right now. 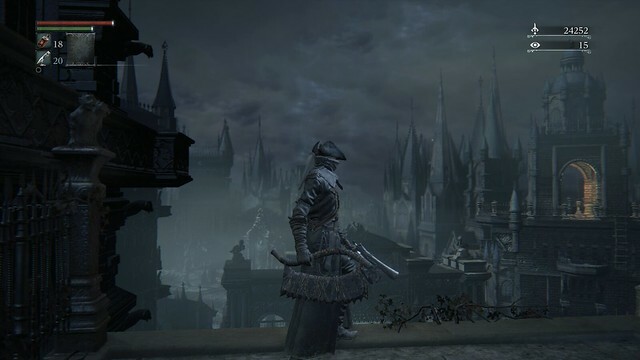 I received city of yharnam theme, but would like to have the Platinum theme as well. Can you confirm if this indeed will be made available in NA? Thanks. What time does the dlc go live?? Does this dlc affect the trophies in any way on the regular game’s, specifically the Hunter’s Essance & Hunter’s Craft trophy since the DLC weapons show up on the list of weapons you have in the reagular game? Recently I finally got that gorgeous PS4. Im dying to get Bloodborne, but…. Anyone knows if that insane Limited Edition is hitting Europe? Or anywhere else than Japan? Has anyone received their platinum theme code yet? I earned it back in May and live in Canada, but still haven’t received an email yet. I’ve got the same problem as Bouta_m89. I had the save at the end of NG+.I defeated hunter in Grand Cathedral but I didn’t get the eye in hunter dream (there was only Old Hunter Bell). So I started NG++, after 2 hours defeated Amelia, touched the skull, went to Hunter Dream and…….. surprise – nothing. There was no Eye of Blood Drunk Hunter. I’m very upset because I waited for this DLC from 5 months ! PLEAS give any info about that glitch ! !